Mastery-based grading is a system of evaluating students based on their demonstrated level of mastery of concepts. The teacher assesses the student’s level of mastery based on the evidence collected. For example, if a student earns evidence scores of 1, 1, 2 and 4 in a particular essential skill, the teacher may assign them a "4" if they feel that the student has mastered the concept – and the student is not penalized for taking longer to achieve mastery. This article outlines the steps for choosing the mastery-based progress report style. Click the Settings link (the gear icon) in the upper right corner of your portal. On the next page, select a Gradebook from the Gradebook Settings section. Click the Go button under Mastery or Traditional Progress Reports. 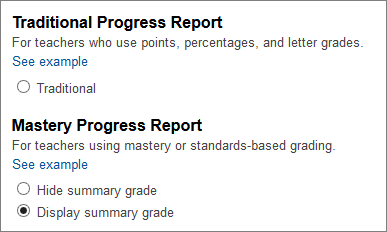 Choose one of two styles of mastery progress reports (see examples in the Confirmation section). Both letter-expressed grade and percentage scores are hidden in this case, along with the grade trend graph, scores per category and grade scale. Last Published - Date and time that scores were last published. Assignment Category - Category for the assigned work or standard. Assignment Title - Title of the assigned work or standard. Score - Points earned on assigned work or standard. Notes/Comments - Displays the custom progress report message. Customize the message to show your rubric scale. Grade Legend - Displays custom codes. Same as above, but the letter-expressed grades are displayed. Current Summary Grade - Based on published grades. If the procedure was carried out correctly, you will receive a message stating that the progress reports now reflect the style you chose.